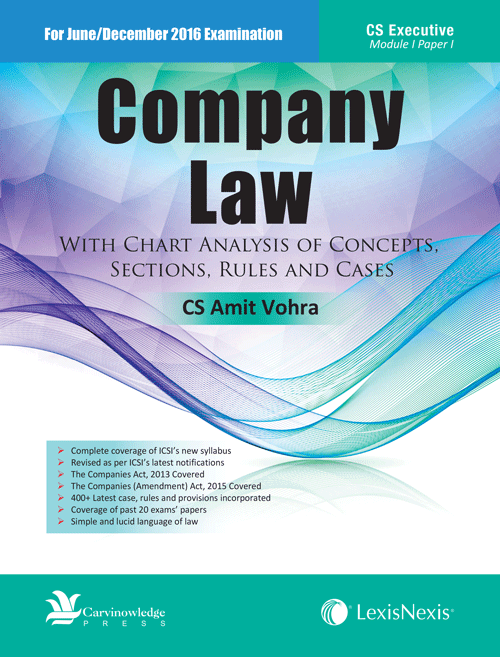 Company Law is a comprehensive book explaining concepts, sections, rules, latest amendments as per ICSI and ministry of corporate affairs of India and cases of Corporate and Allied Laws in a lucid and informative manner. It has been developed exclusively for the students of CS Executive course, Module I – Paper I. All applicable provisions for 2016 examinations according to the ICSI’s notifications regarding the Companies Act, 2013 and the Companies (Amendment) Act, 2015 have been included and explained in a comprehensive manner with solved practical problems and examples. The book will also be useful for the practitioners, professionals and industry people.